France Karnataka General Hospital, the healthcare centre managed by F.I.K, is located in the rural district of Halligudi (3.000 inhabitants), about thirty kilometers from Gadag, a small city of 1.064.570 inhabitants (census from 2011), with a urban population of 35.64%. Although the city of Bangalore has been growing up very quickly economically speaking, becoming India’s high-tech capital, Karnataka still remains one of the poorest and most unstable regions of India. Fast development has brought an explosive economic growth while increasing the gap between cities and rural areas. 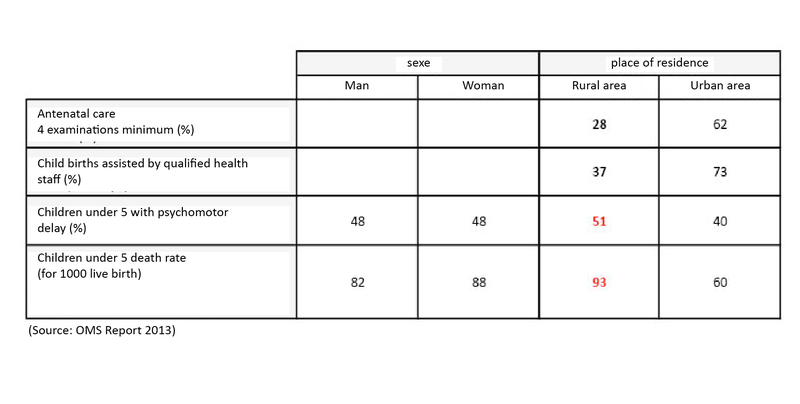 According to a 2013 WHO report, there is a wide gap in health status in India between rural and urban areas. The table below, issued from a 2013 WHO report, illustrates this gap as to pediatric care. The healthcare centre is located at the entrance of the village, and can welcome as many as 3.500 inhabitants. This medical center also has a wider impact and covers 21 villages, for a total of 35.000 potential beneficiaries. The income of village inhabitants is very low, as most of them are farm workers and depend on weather conditions and monsoon. This often does not provide them with the resources necessary to live in decent conditions. Accommodation costs and other charges constitute more than half of the families’ budget, which doesn’t allow them to get healthy food nor access quality healthcare structures, often leading to health issues (breathing, dental, skin…). However, school is free and compulsory for children between 6 and 14 since April, 2010. Hence they have access to education, but there still remain some difficulties and school dropout is high because of delayed psychomotor development and insufficient education monitoring. Furthermore, there is an important lack of public transportation due to a dilapidated secondary road network. It therefore makes it difficult to access public services and healthcare centers.